Are you curious to know what Spanish foods you should try in the Costa del Sol? Of course, everyone talks about paella and churros y chocolate. What about the foods that you don't see in most blogs or guides about the area? Keep reading to learn more about the Spanish foods you must try that are as unique as the beautiful Costa del Sol. Sounds charming, but when you realise that they're small snails, you'll hesitate to try them. They're served with a wonderful broth that's full of spices and garlic. Caracoles are wildly popular throughout Andalucia, especially between Cordoba and Sevilla. They're in prime season between June and the end of July. The best compliment with caracoles isn't wine, but a nice glass of Cruzcampo beer. If you're a picky beer drinker, check out El Grifo Bar in Marbella for a great selection of craft beers on tap. With apologies to Ferdinand the Bull, Rabo de Toro is a dish you must try in Spain. Some menus will list it as Cola de Toro, but they both mean bull's tail. It's hard to describe, but you will never have meat fall off the bone and melts in your mouth the way Rabo de Toro does. This is one of the Spanish foods you must try. Boquerones are a popular tapa and pretty standard on most menus in Spain. They're anchovies that are treated differently from anchovies you'll find in a can. Instead of the dark colour, you would normally see, boquerones are put in a salt bath for several hours and then transferred to a vinegar bath for about 6-8 hours. That's what turns the flesh white. You'll see them on most menus as Boquerones or Boquerones en Vinagre. They're served with vinegar and olive oil and ask for more bread so you can soak up the remaining vinegar. It's delicious! If you're not a fan of anchovies, an alternative would be to get freshly grilled sardines at the beach. Throughout the Costa del Sol, like Rincon de la Victoria, you will see people grilling sardines in boats full of sand. Gambas al Ajilio is a simple dish that's not too far from Shrimp Scampi. It's shrimp that's served with a garlic, olive oil, and white wine sauce. It's also made with chili peppers to give the sauce extra heat. If you love garlic, you must try this dish. Carrillada is a traditional Spanish dish that's made of pork cheeks. The meat is braised and then slow cooked so the meat is tender. It's then served with a tomato-based sauce. The texture of the meat is similar to Rabo de Toro in that it just melts in your mouth. This list only scratches the surface of Spanish foods to try. There's so much more to explore like Albondigas and Salmorejo. Throughout Costa del Sol, you'll find dishes that have Spanish and Moorish influences. That reflects the unique history of Andalucia. 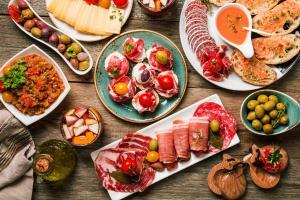 Living the expat life in Spain isn't always easy, and knowing that you have incredible dishes to try can make the adjustment easier. Whether you're trying to find a home or navigate the healthcare system, we're here to help. Contact us today to see how we can help you move to Spain.